Hotshots Entertainment is a Bristol based company with a highly experienced, professional Wedding DJ and photo booth hire. Morf Bray started out in 2001 as a karaoke DJ, but time moved on with his passion for music and making sure everyone has a great time. Leaving the pub and club days behind him, he wanted to put his skills and knowledge into weddings. His dress code is always smart, trousers, shirt, waistcoat and tie. Operating within a 100-mile radius of Bristol center. We have recently upgraded our equipment to give YOU & YOUR guests a better sound and light show. Using the very latest FBT speaker range (Italian made – only the best). Wireless Microphones (professional standard). ADJ Inno Rolls 80w LED. ADJ 75w moving heads. Freedom sticks. 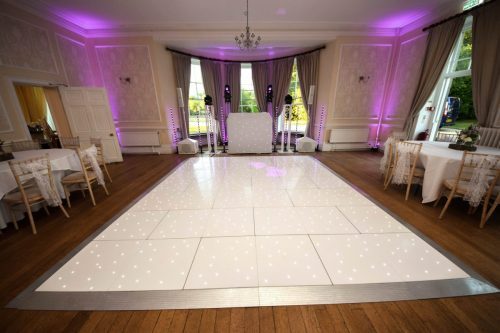 Wireless uplighting plus, LED dance floors and also a “Star cloth”. We also have a mini version of our silver show for much smaller venues, such as Racks Bar & kitchen. 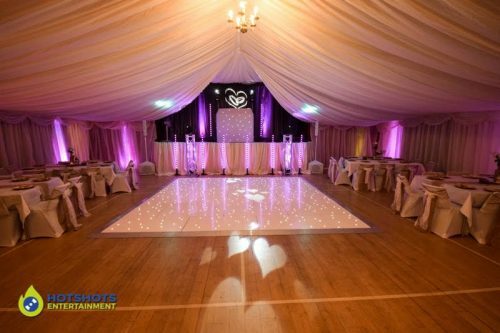 We have been supplying discos there for the last 15 years. Select from a choice of wireless up/mood lighting to blend in with your chosen colour scheme. With soft ambient lighting which can truly transform any venue and also creating the perfect atmosphere. Professional sound and lighting equipment and with our huge range of sounds from the 50’s to the present day. We will ensure that we provide the very best in entertainment for YOU & YOUR guests. Looking after all of your entertainment, we can put you in touch with Bands, singers and harpists. Finally, as a result, our reputation for providing a first class service is endorsed by our numerous satisfied clients (see our blog for testimonials).